I'm usually that type of blogger who takes her outfit shot whenever she feels like it. There are times where I don't have time to retouch (or even put on my makeup) and I just let whoever is with me (who is usually Paolo) to take my OOTDs. Just like in this set of photos where I asked my cousin to take my photos minutes before we head to divisoria. I chose to wear this thrifted floral sweater cause its unusually cold at the bridal gowns level at 168 mall. Since my family and I are just going to Divisoria, I was asked to dress down, and so I agreed. I still made sure that I'm at least wearing one statement piece-- and that would be my all time favorite boots. #selfie shot before gym. I love how I still look fresh that time! Since I was late, attended the body jam class for 40 mins! Love it when Theena teaches the dance! Jam kung jam! Then did the Workout of the Week with my new fitness partner, Shyne Marasigan! and finished the workout with a 15-min CORE workout c/o Nike Training Club. That's roughly 2 hours at the gym with rest minutes and of course instagramming and picture taking in between. Wow 2 hours! 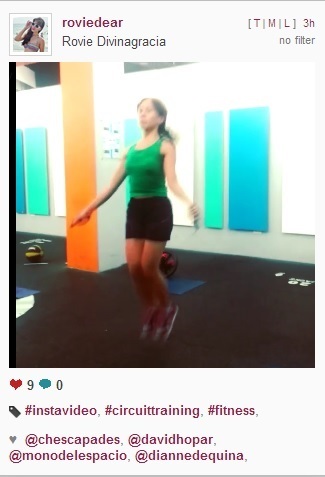 I go to 360 in Makati, I should try their WOWs/WODs! I just love your styling sense.It's really cool. Hehe hey i just got home fr lucky chinatown! Nice top.. I love the color, prang brand new pa yan ah! So pretty naman my twin!! :) Love that floral sweater on you ♥ And bongga talaga ng workout sessions mo. SALUT! Hahaha! I'm seeing the results of the consistent Gym work for you. I guess your a natural when it comes to outfit posts as you can do it anywhere with not much preparation. I love the sweater and the high waist pants! Looking good Rovie! Work it girl! I can't wait to see the final result and of course, you in your wedding gown. :) I never got the chance to be in it which is why I enjoy looking at women in their bridal gowns. Btw, I really like your shoes....I wonder where you mom bought it? Perfect pati ang color. makahanap nga ulit online. hehhhe!